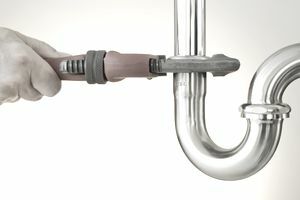 It is not uncommon for metal pipes in a plumbing system to bang loudly when a faucet is shut off suddenly, or when a water-using appliance such as a washing machine or dishwasher shuts off the water intake abruptly. The condition is commonly known as water hammer. The technical term is hydraulic shock, and it occurs when water stops or changes directions suddenly. The banging you hear is caused by the shock wave that causes plumbing pipes to move and strike against one another or against wooden framing members. In addition to being annoying, water hammer can be so forceful that it can break pipes or loosen plumbing joints. Note: Although you don't hear it as loudly, water hammer can also be an issue with plastic water supply pipes, such as CPCV and PEX. And the potential danger for pipe damage still exists. If you have open areas where plastic plumbing pipes are exposed, watch the pipes for signs of movement and flexing when someone abruptly turns off faucets. Water hammer in plastic pipes also calls for remedy. There are four common methods of eliminating water hammer. Even a mild shock wave can create loud banging if the plumbing pipes are not secured well. A mild case of water hammer generally doesn't cause pipe damage, and you can prevent it by tightening any loose pipe straps of hangers that secure the pipes to studs or joists. Segments of foam pipe insulation wrapped around the pipes can also serve as shock absorbers to prevent banging. This is easiest to do in exposed, unfinished areas, such as a basement space where pipes are visible and accessible. If you see areas where the pipe straps or hangers or loose, resecure them. With very pronounced water hammer, this method will probably not be enough to prevent potential damage to the pipes. With severe water hammer, you will need to try one of the other solutions. Note: Make sure not to mix dissimilar metals when securing metal plumbing pipes with metal straps and pipe hangers. Do not use steel or galvanized steel straps on copper pipe, for example, because a chemical reaction called electrolysis can cause corrosion of the metal. Secure copper plumbing pipe with copper or plastic pipe straps and hangers. Another very simple method of curing air hammer is to install a short segment of vertical pipe near the valves that are causing the water hammer. Known as an air chamber, this method creates a segment of empty, air-filled pipe that provides a cushion for water to rebound into when it wants to change directions suddenly. An air chamber is often fabricated onsite by the plumber as he or she installs the plumbing system, using ordinary pipes and fittings. Or, you can buy commercial air chambers, which are really just short stubs of pipe that are already capped. Either way, an air chamber is comprised of a tee-fitting that connects to the main plumbing pipe, with a short run of horizontal pipe that then leads to a section of capped vertical pipe roughly 6 inches long. Because this dead-end pipe is located outside the main water flow, it traps a pocket of air. In operation, when a faucet or other water valve shuts off quickly, the air in the chamber compresses temporarily under the water pressure, absorbing the shock that otherwise would go into the pipes and cause them to bang. In many homes, the air chambers are located near the wash tub alongside a washing machine, a common source of water hammer. But it is wise to install air chambers at critical spots throughout a building. Local building codes may require them at prescribed locations. Shut off ​the main water valve to the home. Open the building’s uppermost water faucet. Drain all water from all pipes by opening the lowest water faucet, normally located in the front yard or the basement of a building. As the water drains out, air will flow into the system through the uppermost faucet, automatically adding air back into the air chambers. On very rare occasions, air chambers can become clogged with minerals or other debris. They can be cleaned by removing the caps and scouring them out. Installing air chambers that are larger in diameter than the main plumbing lines can also help prevent clogging. Note: In some areas, building codes may rule out air chambers in favor of mechanical water arrestors or other methods. Mechanical water shock arrestors are a more sophisticated form of absorbing the shock from water hammer. They work well in situations where air chambers are impractical. Water arrestors are sealed units that contain a spring and air bladder that absorbs water movement to mitigate the effects of water hammer. They are the preferred alternative in commercial buildings and for high water pressure applications. Mechanical water arrestors do not need to be recharged like air chambers, but they will need to replaced at the end of their life cycle, when the inner springs and bladders wear out. Water hammer arrestors can be integrated into utility sink faucets or washing machine valves. They usually have compression or screw-on fittings for easy installation. Mechanical shock arrestors are manufactured to a nationally recognized standard from the Plumbing and Drainage Institute, known as PDI - WH201, which also includes a method of sizing these devices. Water hammer can also occur when the overall pressure of the main water pipe entering the building is too high. Normal water pressure runs between 30 and 55 psi (pounds per square inch), and above this, the high pressure could be the source of water hammer. Very high pressure above 100 psi can also damage appliances. In this case, installing a water-pressure regulator can solve water hammer issues. Where possible, it's better to install the water-pressure regulator at the location where the main water supply enters the home rather than installing multiple air chambers, because the device also protects dishwashers, toilets, and other appliances and fixtures against high water pressure. Start by testing water pressure to verify that it is higher than normal. After installing the water-pressure regulator at the main water supply entry, adjust the regulator to a pressure below 50 psi.